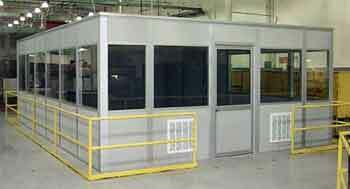 Modular Building Sales & Installation Nationwide. Sometimes, the pace of growth of a business can exceed the available infrastructure, and require the addition of extra space for staff at very short notice. When such growth cannot be accommodated within your existing premises, damage can be done to the growth of the company unless appropriate space can be found quickly. Expanding your existing building can be expensive and is a long process that is fraught with costs and regulations while moving to new premises is an even more complex process. 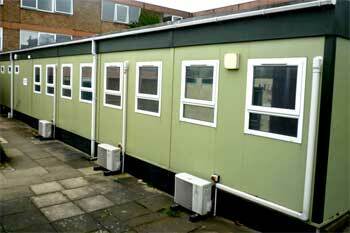 Modular Buildings offer a cost effective and fast way of developing additional space for your business to occupy. In essence, modular buildings are temporary structures that can be fitted together from prefabricated parts, and feature panels that are bolted to a frame. There are a number of different variations on the standard modular building model, and the biggest advantages that they have is the speed with which they can be constructed in comparison to a conventional building. 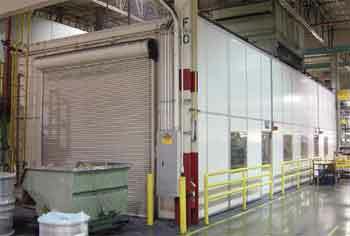 In the past, modular buildings had a reputation for being ugly and drafty temporary places that were noisy and cold and did not offer the basic facilities that are required in a modern office such as adequate power supplies and integrated telephone systems. The days of the beige box are now long gone however, and modern modular buildings are designed and built to a much higher standard than ever before, and feature high quality components throughout. The decoration of each installation is designed to match your specifications to ensure that the new building matches with the rest of your building. Modern modular buildings are custom designed to your exact needs, and include all the facilities that modern business requires. You can specify everything from the color and position of the interior walls through to the number of power outlets and telephone sockets that are installed in the structure. Thanks to the use of ¼” tempered glass throughout the construction of the building and the inclusion of sound reduction panels in both interior and exterior walls, it is easy to work inside the building without having the sound from outside interrupting and disturbing you. There are modular buildings that are designed for both interior and exterior use, so whether you are using space within a large warehouse or factory building, or alternatively need to expand outside to get enough space for your additional space, you can choose a building to meet the exact needs of the environment where it is to be located. One of the main advantages of choosing a modular building is that due to the nature of the construction it is possible to make changes to the layout and structure of the building in the future to ensure that as your business changes, your facilities will be able to grow and adapt with you. Thanks to the ease with which the construction can be carried out, and of course the lower cost point offered by modular buildings over traditional construction methods, it makes a lot of sense for your business to choose this system ahead of the alternatives, because you will be able to achieve the additional space that you need in a fraction of the time that would be needed otherwise, and at a much lower cost than if you were to have the structure built using traditional techniques. As you continue to read through our selection of Modular Buildings, keep in mind we stand ready to answer any questions you may have about our offerings. Call us at 1-888-776-3720 whenever such questions arise and let us help you make the best investment within your budget. We are located in Houston, Texas.